After the Olympics of 2012, and the after-glow of the success of team GB the previous year, the weather finally arrived. 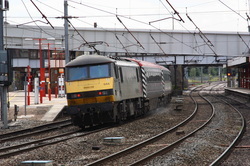 Also Moyes took over (sorry, succeeded Ferguscum of Salford) And finally, a little bit of that SUN!! 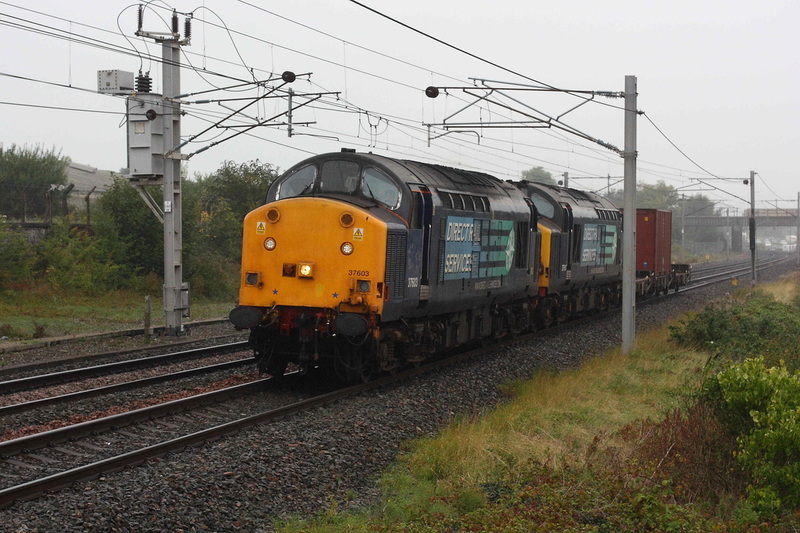 37603 /611 head to Crewe with 6K73 from Sellafield via Workington and Carlisle. 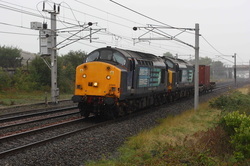 By the way, it's grim and damp today! 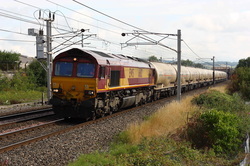 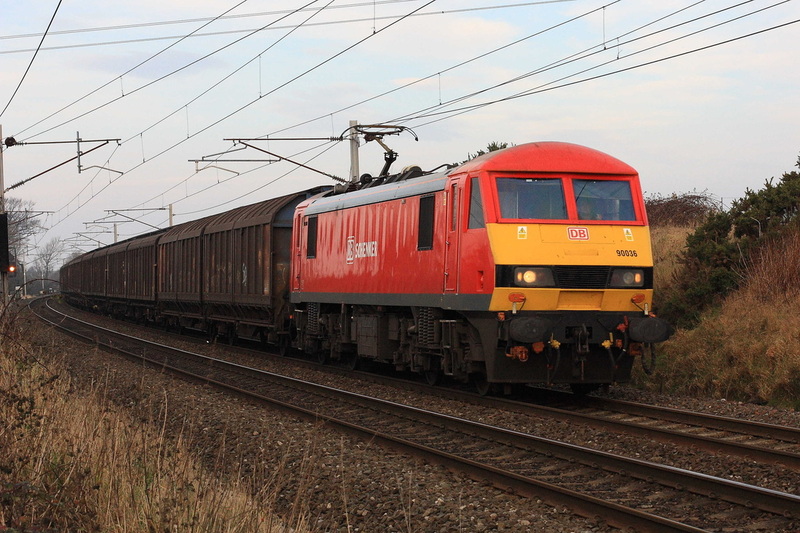 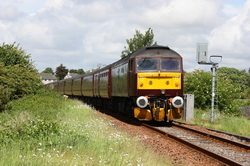 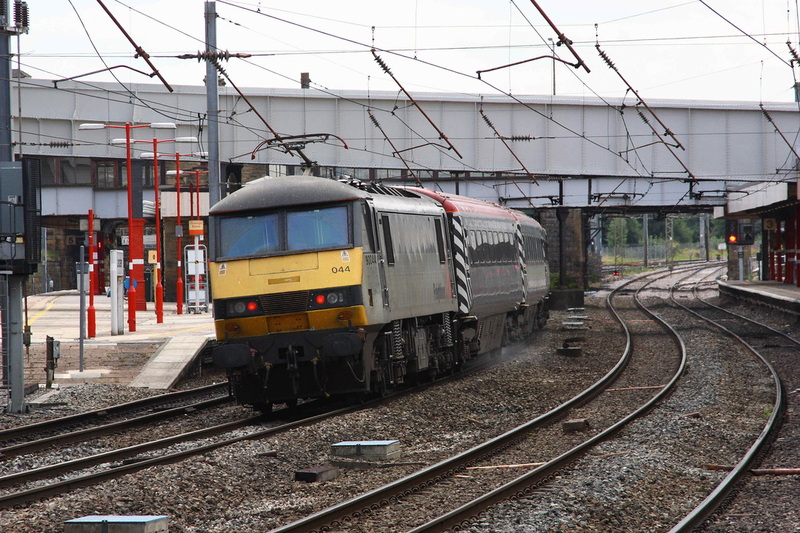 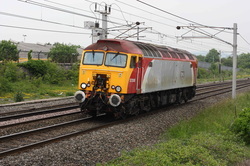 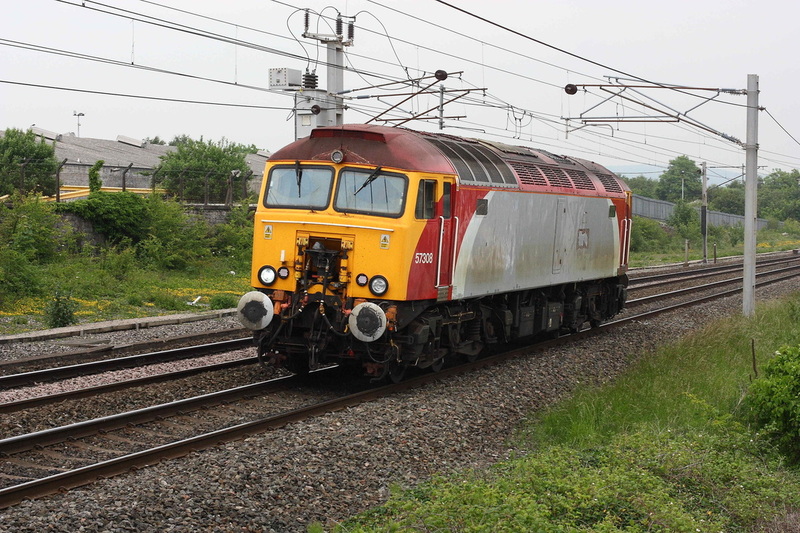 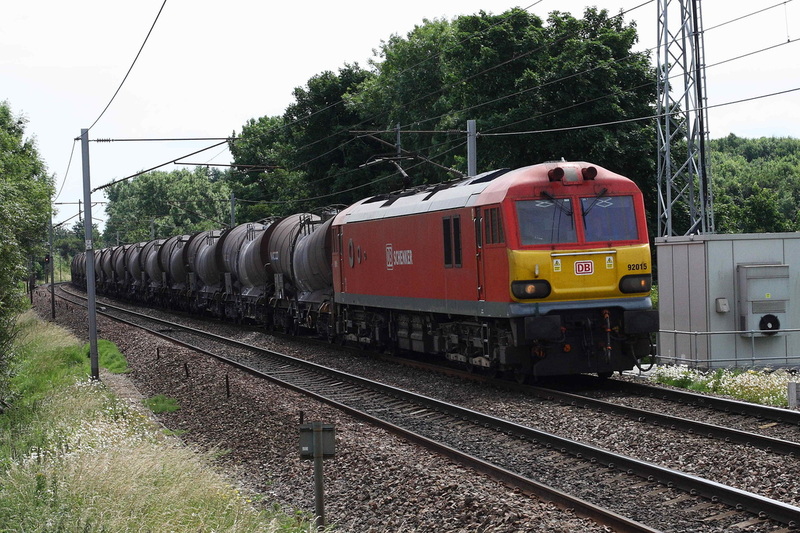 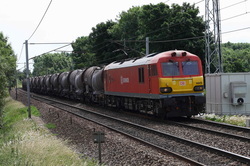 Demic 57/3 is hauled by Stalwart, 40-odd year old, 47804 into Carnforth on 1Z29 Dundee-Blackpool. 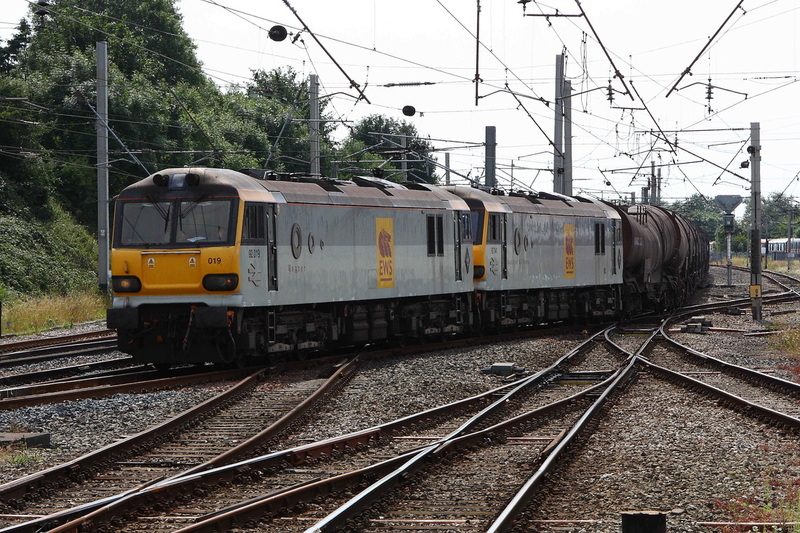 An unusual light engine move, as normally these come in pairs. 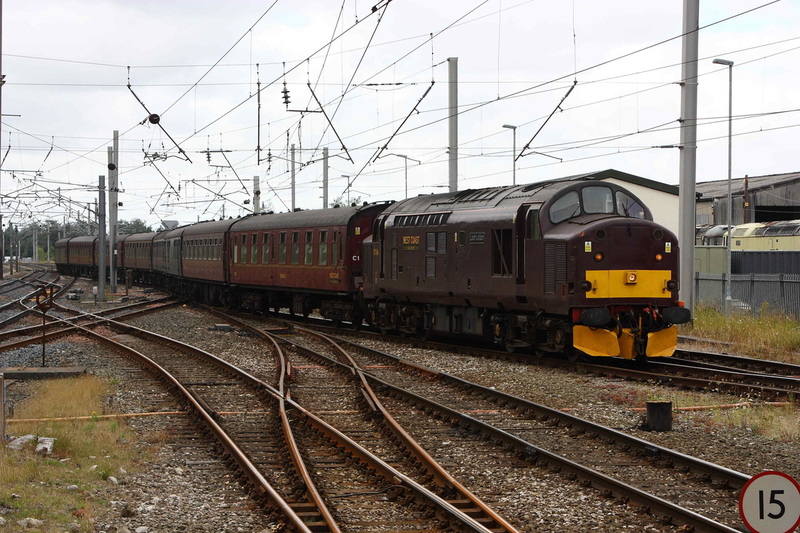 "Dante" arrives with 0Z30 at Carnforth, with a DRS driver training run, in preparation for DRS hiring DBS 92s for Intermodal services from Daventry. 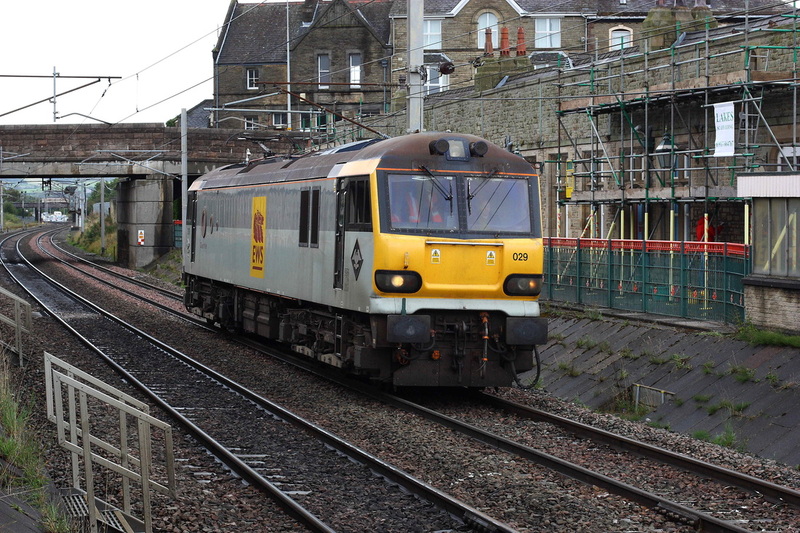 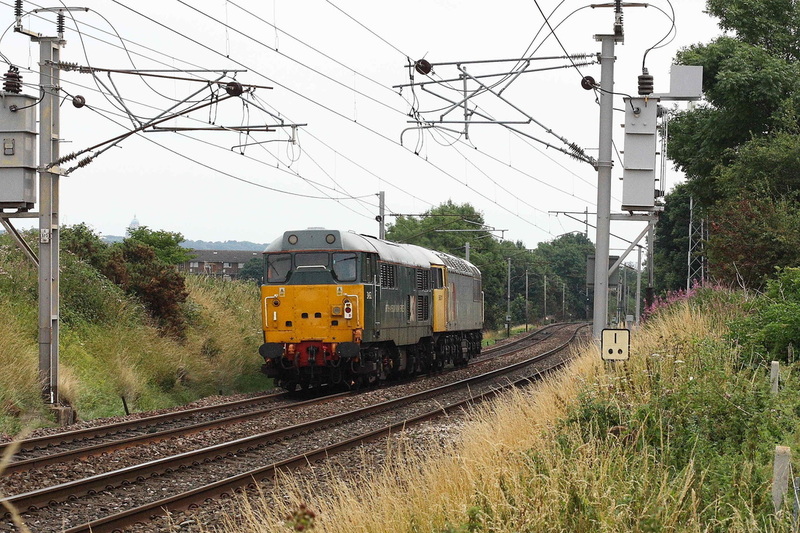 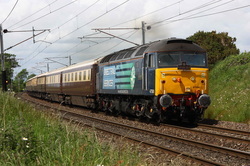 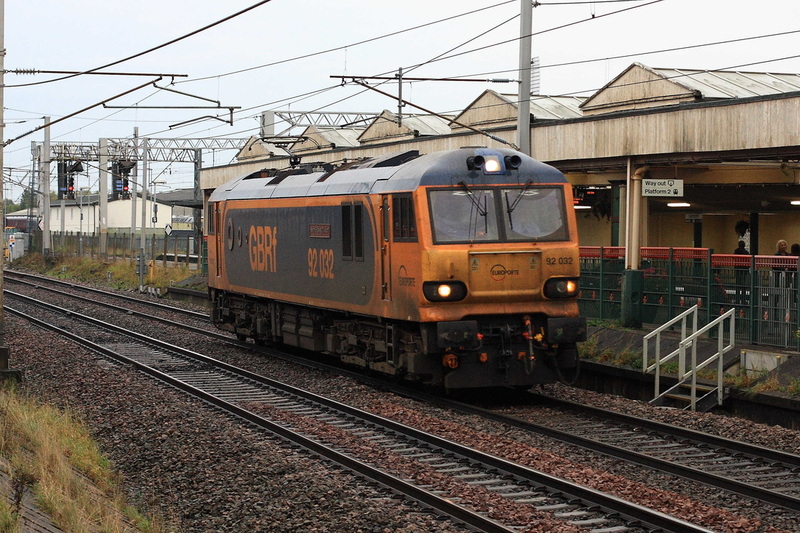 A short while later, more heritage traction with Grid 105 working 6S96 to Grangemouth from Derbyshire. The Grid could be heard coming through Lancaster about 1.5 miles south of this location. 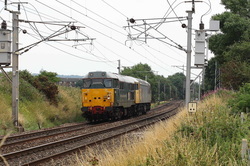 And just to finish off a belting 2 hours or so, Tractor 37516 passed me 2 minutes later heading for Crewe with ecs stock. 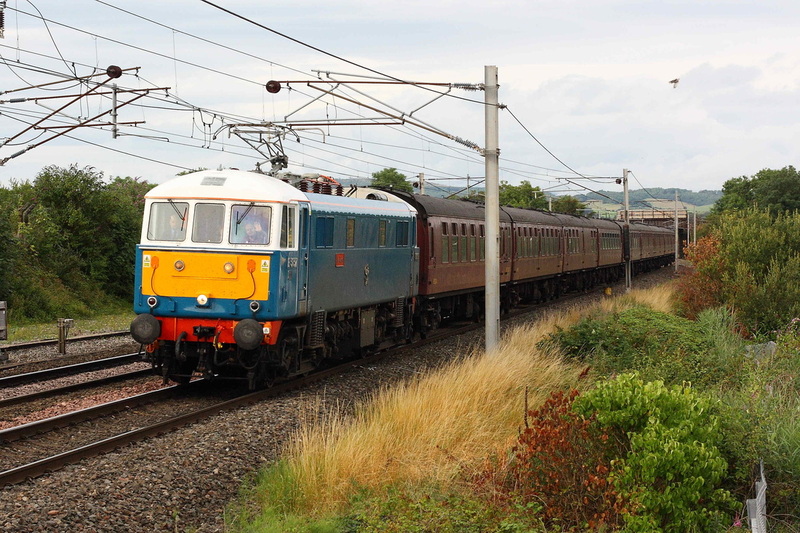 6S94 runs as a proper train for the first time in weeks, after light engine moves and non-runners, and with a DBS Pink Dyson 92015 instead of the Triple Grey versions. 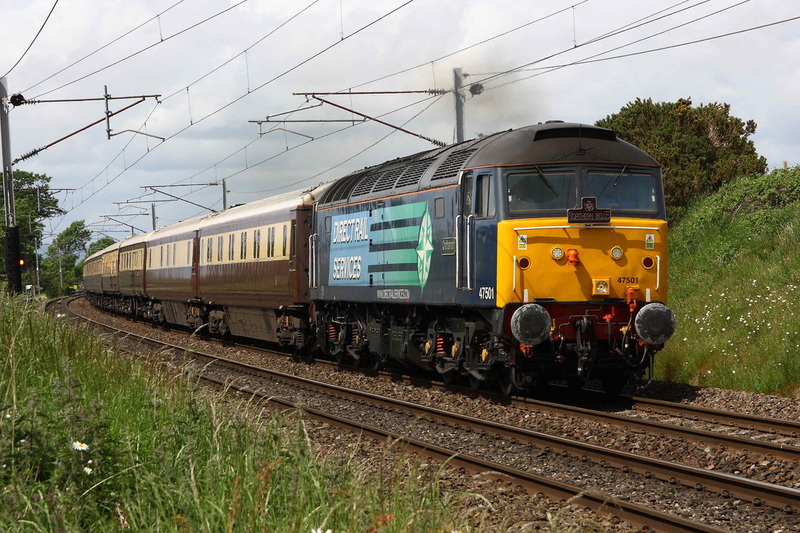 DRS thunderbird 57304 " Pride of Cheshire" heads towards Lancaster with 5Z41 Kilmarnock-Wembley. 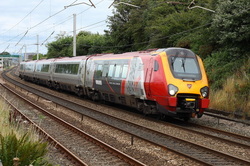 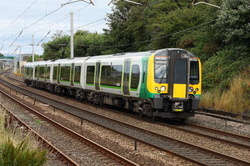 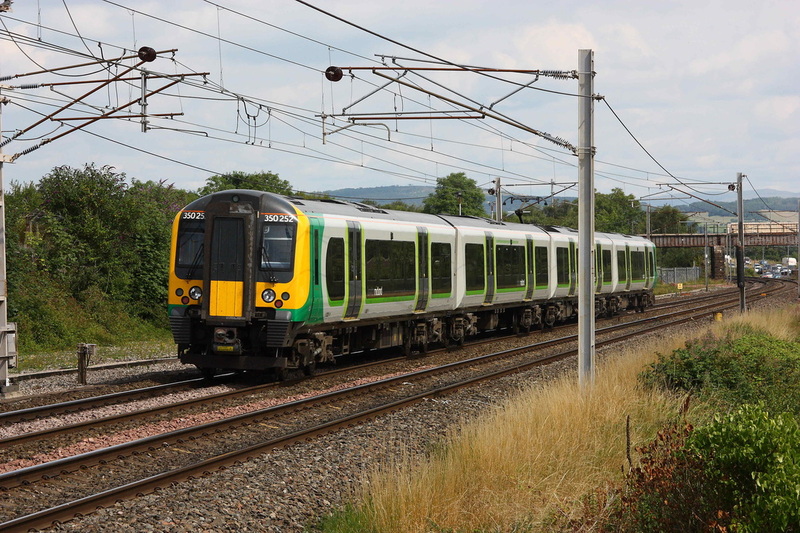 It was returning the Virgin MK 3 Pretendolino back to Wembley in readiness for diagrams on the Birmingham/Wolverhampton-Euston route whilst the WCML blockade is on next week. 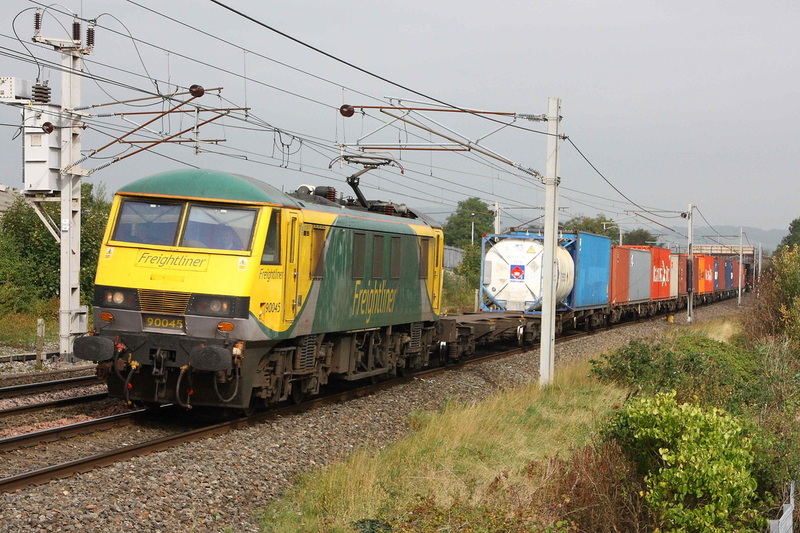 At this point, the working was 30-odd minutes early, having been 2 hours down at one point. 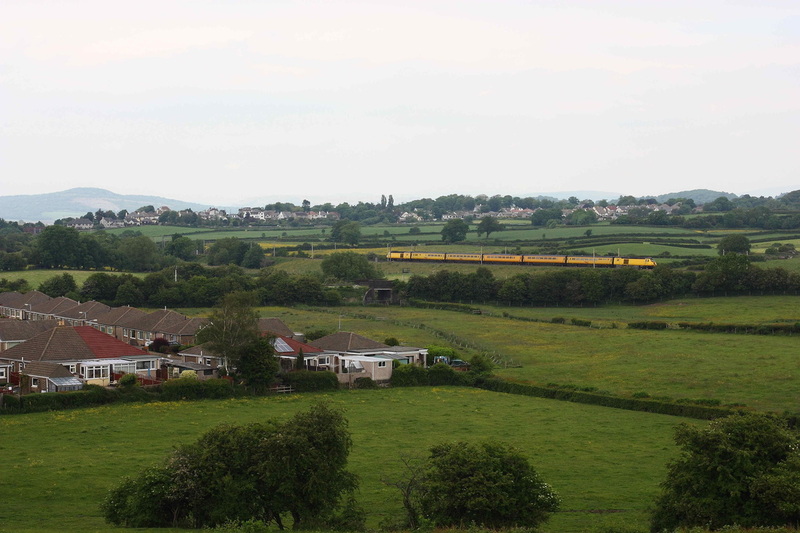 Double Grids seems to be the order of the day at the moment, following a succession of failures, as 105 and 087 head 6J37 past Hest Bank. 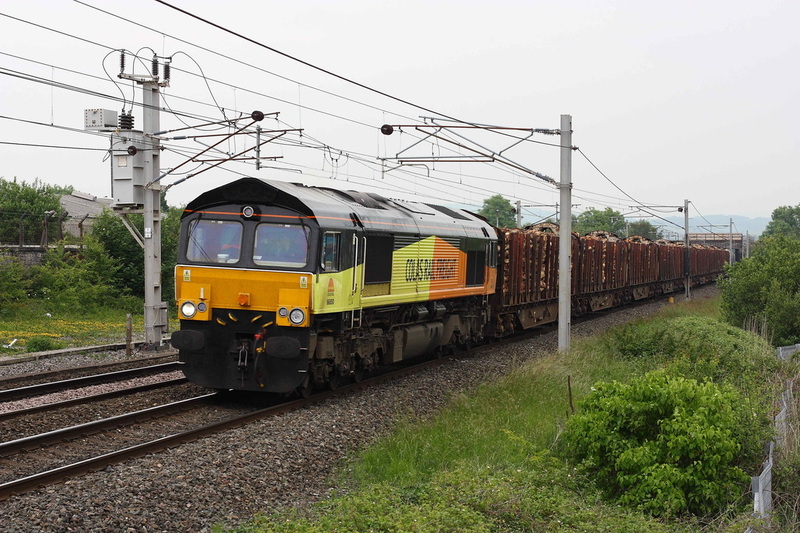 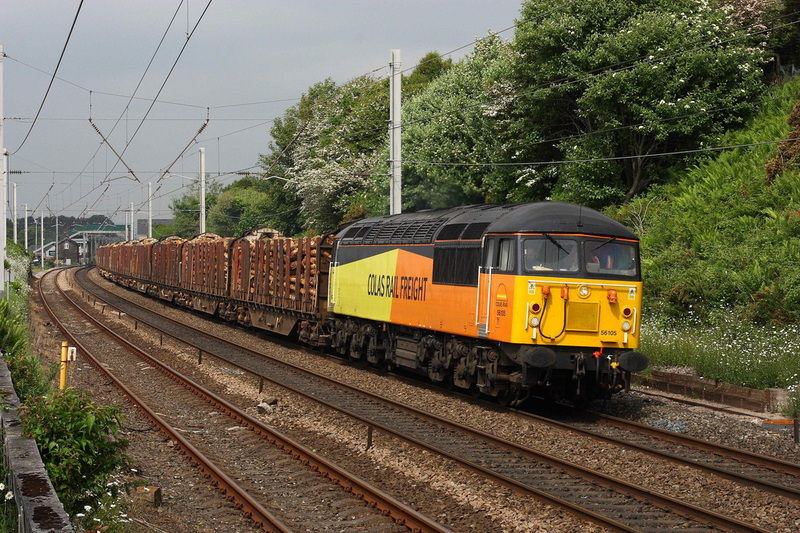 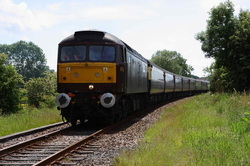 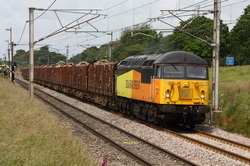 56094 completes the June Colas 56 gallery, with the empty logs from Chirk to Carlisle. All of the currently operative Colas 56's in one calendar month. 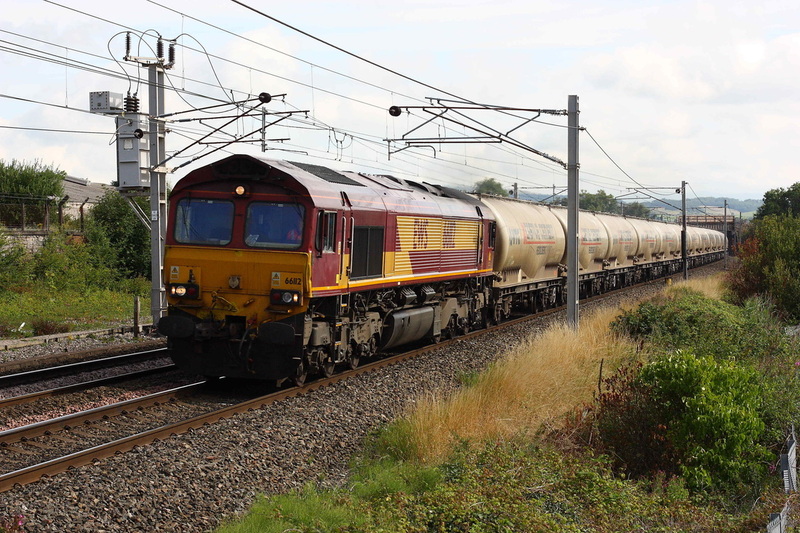 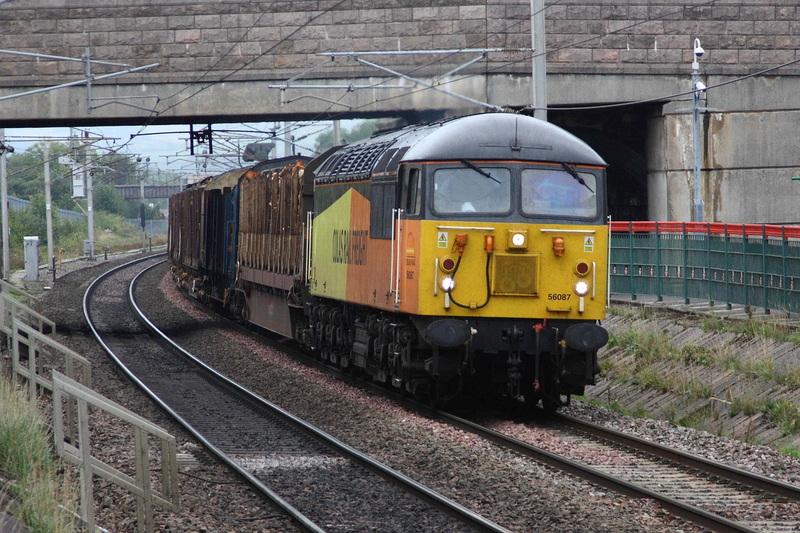 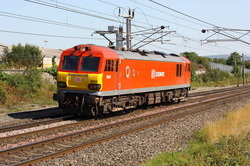 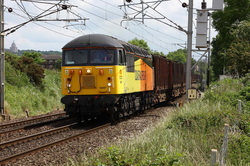 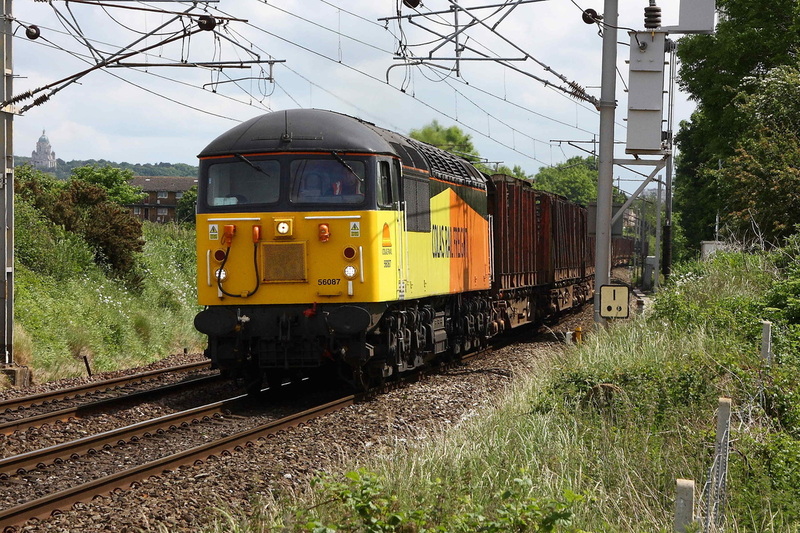 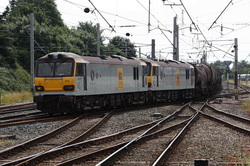 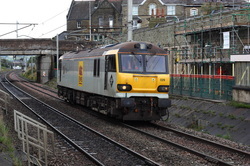 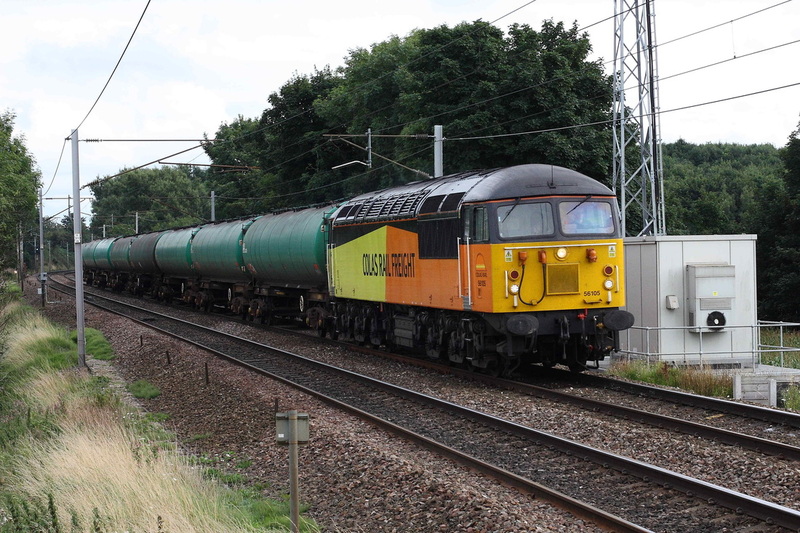 Colas 66850 enters Carnforth with a 6J37 STP working. 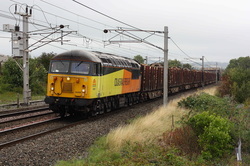 Grid 087 had failed on the northbound empties a couple of days before, and as a result, the southbound workings were cancelled, due to a lack of locos to take the loaded trains from Carlisle back to Chirk. 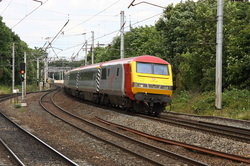 Ex-Virgin Body snatcher 308 runs to Gresty Bridge light engine, a few minutes later. Note it is de-branded and nameless. 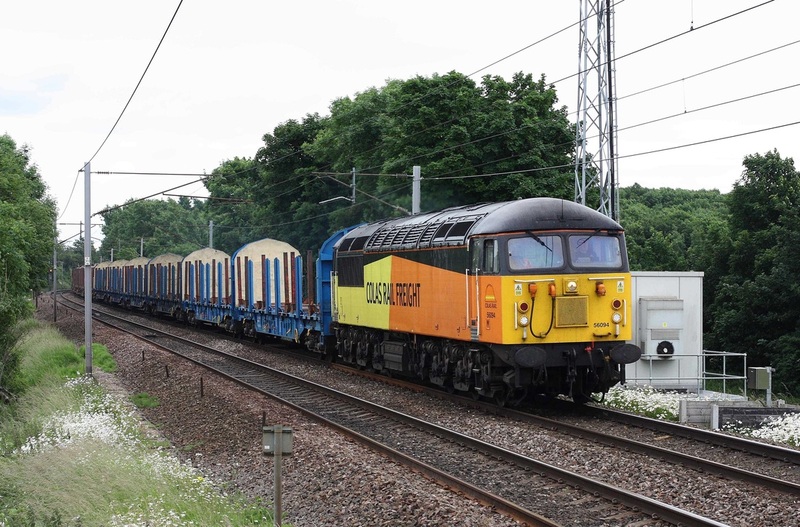 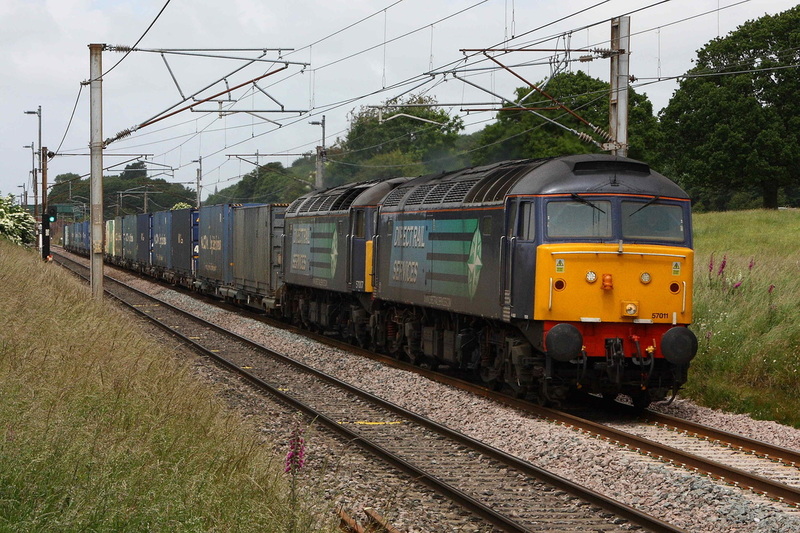 Heritage traction with DRS 37610 and 602 heading a well loaded 4M44 to Daventry. 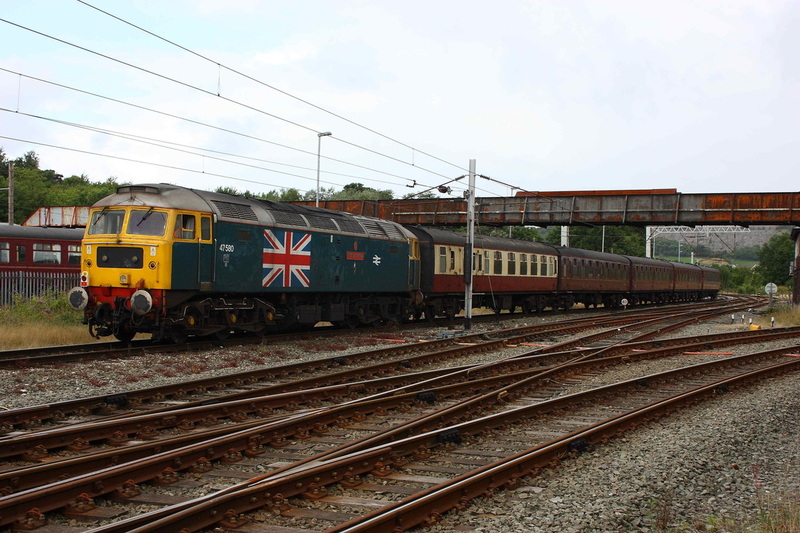 Great stuff for locos over 50 years old! 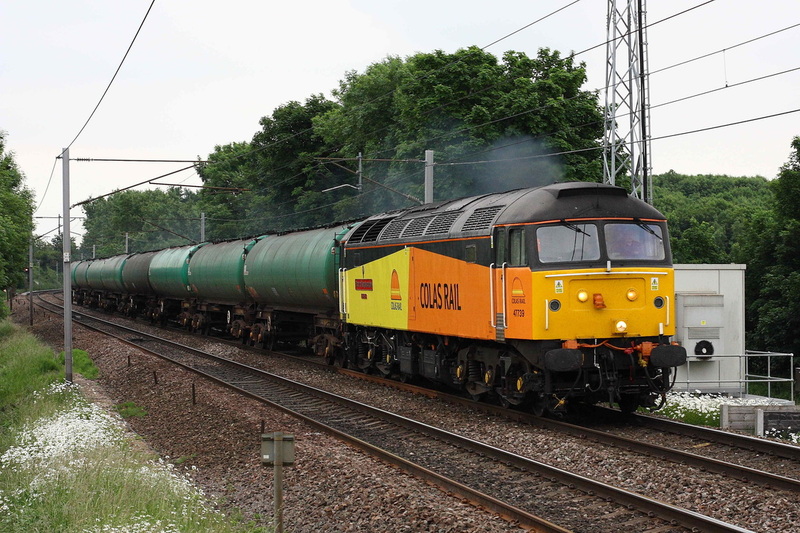 And finally, as a result of Colas loco shortages, Veteran 47739 starts to open up leaving Lancaster, with a loaded 6S96 Sinfin-Grangemouth Tanks. 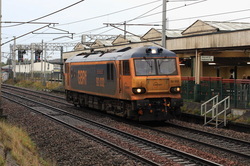 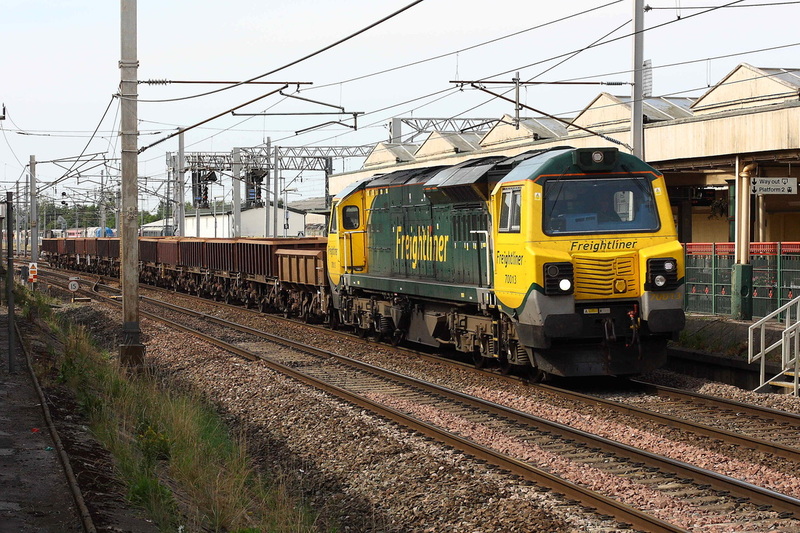 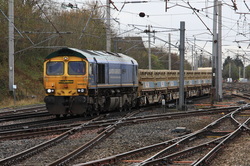 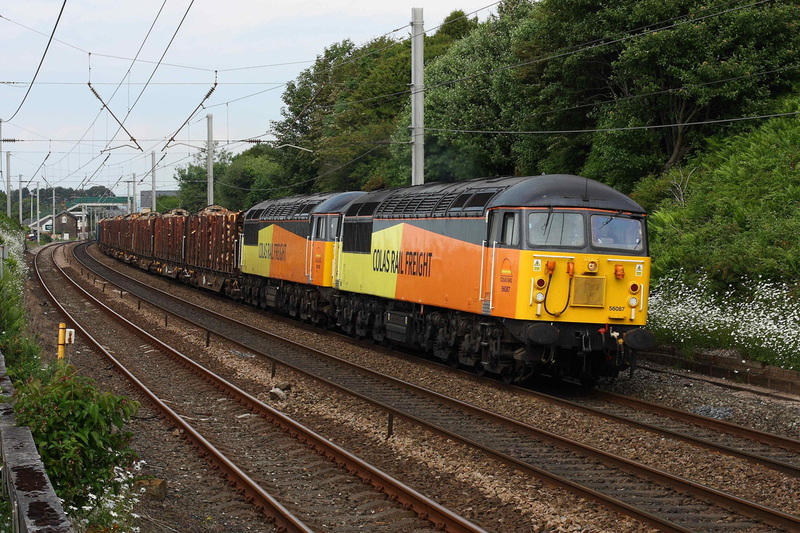 The veteran loco had run light to Carlisle late on 19th, to swap with 66850 on the southbound empties, meaning 66850 was then available to work the extra path on the Logs, (seen above). 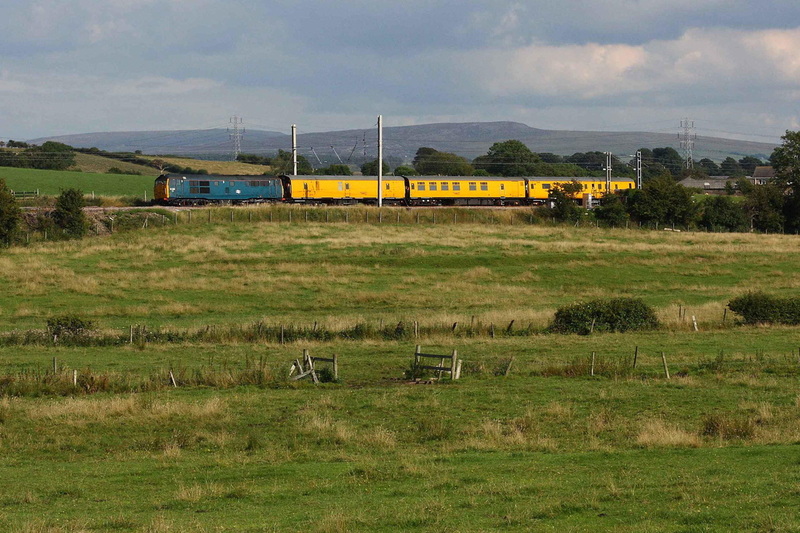 Body snatchers 008 and 010 head 4M44 into Carnforth in full sun. 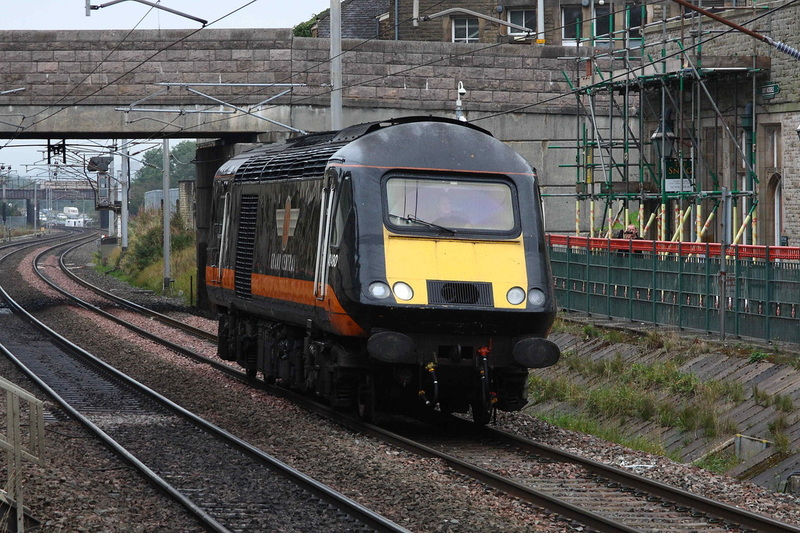 Soon there will be no DREDS!! Back to dull but warm, as the NMT passes MSJ with 1Q37 Heaton-Crewe LNWR with 1Q37. Hope that wasn't Summer 2013!! 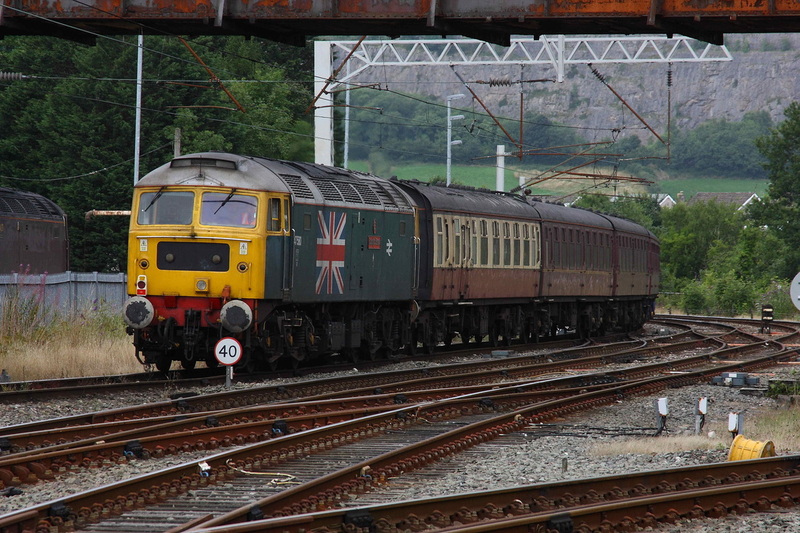 And tailing was Northern Belle liveried 47832 which was powering as well. 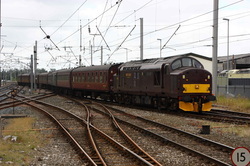 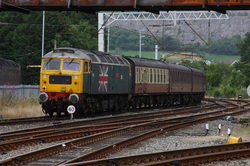 47786 heads the charter ecs back to Carnforth after abandoning the punters in Morecambe for 2 hours. 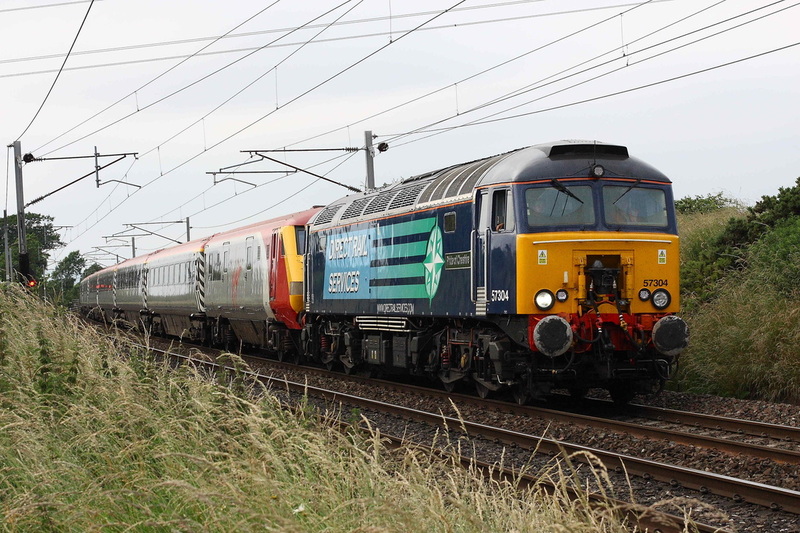 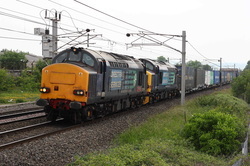 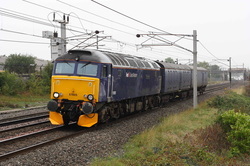 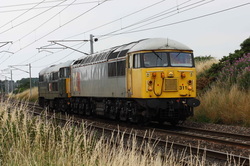 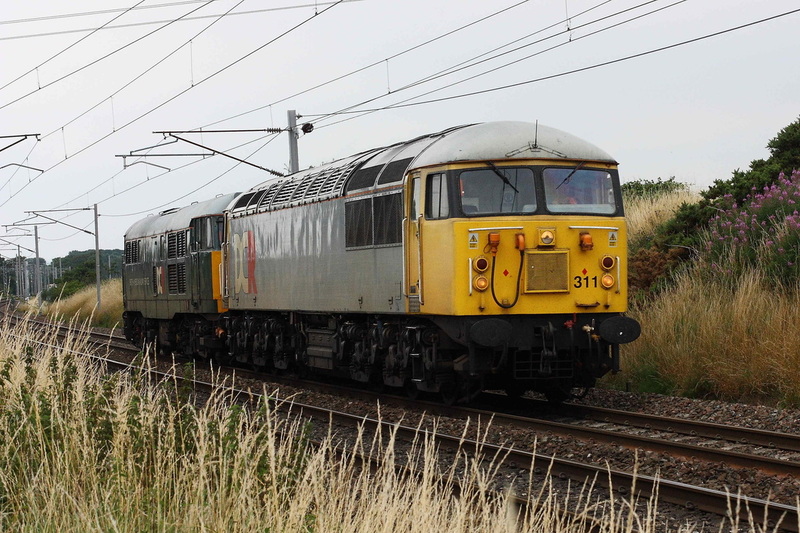 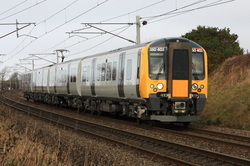 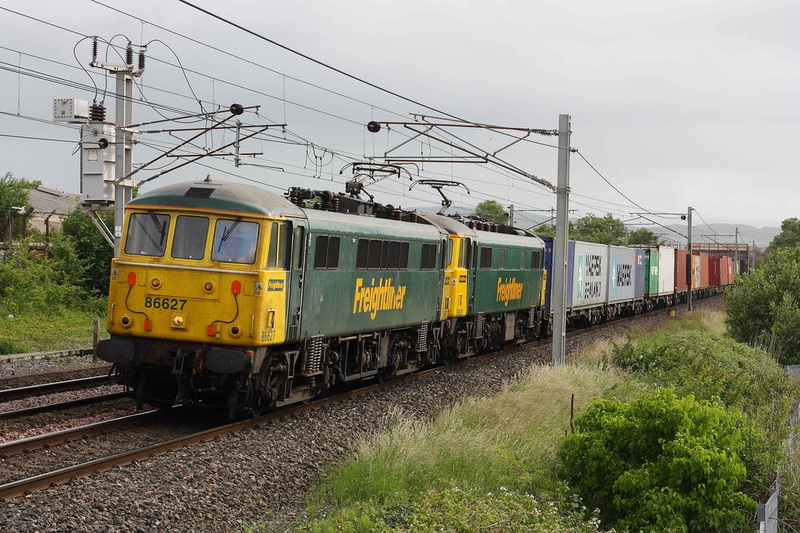 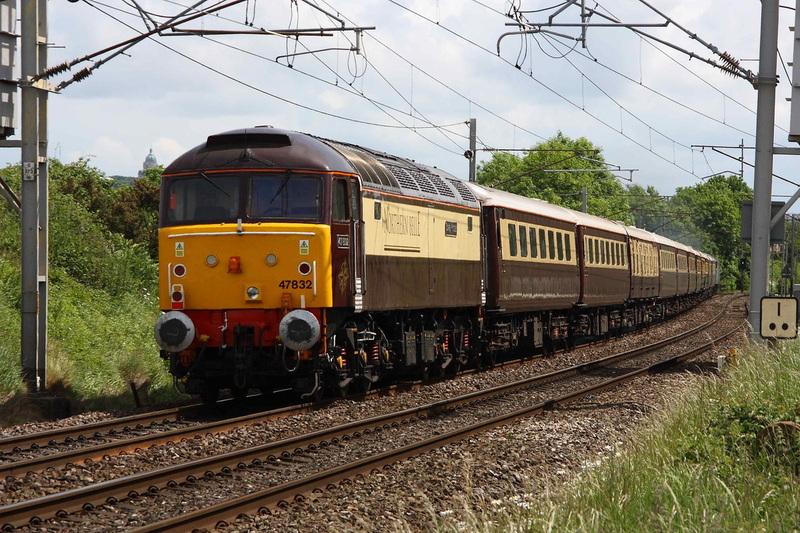 47854 had led the charter towards Morecambe, on the link from the WCML to Bare Lane, at the back of Morecambe Golf Club, with 1Z77 from Perth. 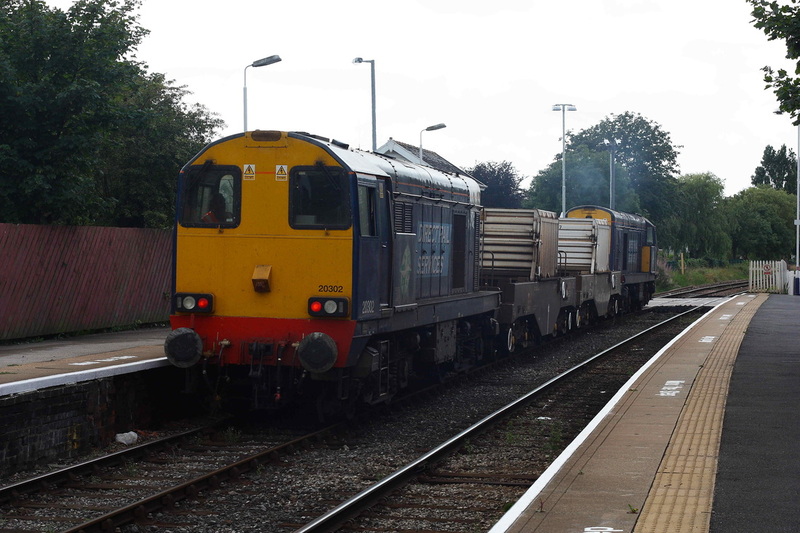 Now seen tailing the ecs. The sun re-appeared just before this came south at Hest Bank, between some angry dark clouds and spots of rain, as 56105 heads 6J37. 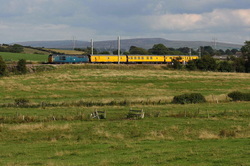 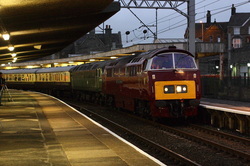 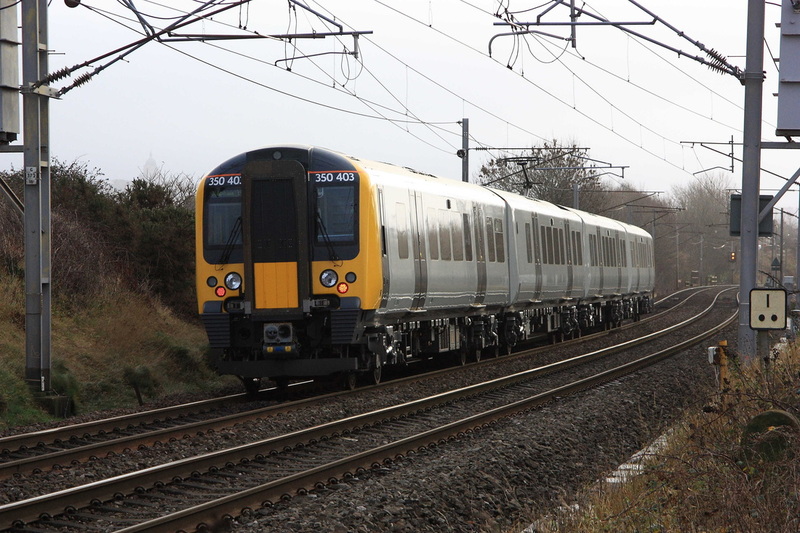 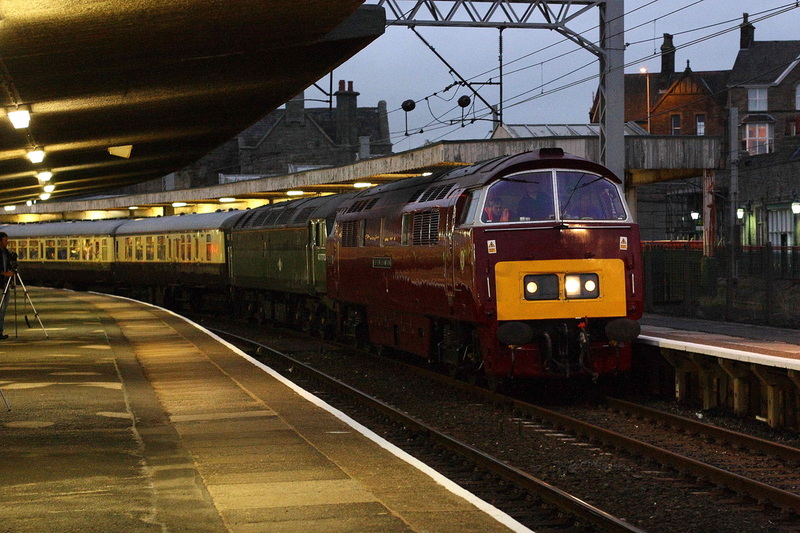 The northbound venture to Carlisle would be cut short the following day, as 105 was declared a failure at Carnforth.